Consistent quality keeps the Maxum SR3 leading the field. This boat is a great vessel for a family of four to take cruising. Sporty performance and good handling make the Maxum SR3 a fun means of exploring your local waterways The driver’s seat has a bolster, so you can drive looking over the screen. I’ve been testing boats for longer than I care to remember and I’ve come to the realisation that there are a number of brands on the market that I can rely upon to consistently turn out quality products. Maxum is one of them. This 2008 Maxum 2000 SR3 didn’t let me down. She’s a production boat, and there are thousands of these boats on the water right around the world, but, as Maxum says, “she’s got an engine that purrs, style that turns heads and enough versatility to let you master the water any way you choose”. This boat gets a ‘tick in all the right boxes’. She’s priced right, delivers an exceptional build quality and can boast first-class fixtures and fittings. But for mine, it’s her versatility that makes her a real winner. This 6.2m bowrider is a true family boat. She’s a great vessel for a family of four to take cruising up a river system such as Sydney’s magnificent Hawkesbury, or around the Harbour, before pulling into a secluded bay for a picnic lunch. The kids can even bring a few mates along and you still won’t be overcrowded. But cruising is only one of her fortes. Even fully loaded, at 35mph (30.4 knots) this hull produces an excellent flat wake for skiing. She’s not a dedicated ski boat, but for family skiing and towing water toys, she’s ideal. But if you knock the throttle back a few cogs and drop the speed to around 20mph (17.4 knots), then take the rope from the transom ring and hook it onto the tower, the weight of her rear-mounted 5.7L V8 engine helps her wall up a good wake for ‘boarding that even pros will appreciate. The 5.7L, 300hp, 350 Magnum MerCruiser V8 purring away in the test boat’s engine bay powers this boat to more than 60mph (52.1 knots) at 5800rpm, so no one can dispute the grunt she has to offer. But throttle back to 2800rpm and she’ll cruise around very economically at a comfortable 30mph (26.1 knots). The 2000 SR3’s hull gives a smooth, responsive and agile ride. This is another hull that features wide downturned chines, carried well forward, and an almost flat plank section along the keel, for quicker planing, better lift at slow speeds and stability at rest. The hull also has quite a flare in its bow. Coupled with the aggressive chines, water and spray stay outside the boat where they should be-even with a crosswind coming over the bow. This hull also tracks straight and still turns like a rocket sledge on rails when the leg is left ‘trimmed out’ without tail slip or cavitation. The Maxum’s helm station was designed for the driver and has all of the SmartCraft instrumentation in clear view. Plus, the Digital Throttle and Shift (DTS) binnacle is in exactly the right position for effortless operation. The driver’s seat has a bolster, so you can drive looking over the screen, but with the bolster down; visibility through the windscreen is good and the screen deflects the slip stream up and over the driver and anyone seated in the cockpit. But what would be handy is a board, or clip-in vinyl screen, to partition off the bowrider section and seal off the cockpit area for the run back to the ramp in the afternoon. This would extend your boating season during the cooler months. The 2000 SR3 test boat was set-up with the ‘Sport Seating’ option. Unlike standard seats, (two quarter seats on each side of the engine box), there’s a sun pad right across the transom with a headrest that can be raised to 45 degrees at one end and removable cushion at the other. This can be taken out to make boarding easier via the transom step- through. The wide swim platform is useful for ‘gearing up’ when ‘boarding or skiing and the folding swim ladder makes boarding from the water a breeze. While the bowrider cockpit will seat four, maybe five people at a pinch, only two can stretch out here and enjoy the ride. This area is heavily padded. There are drink holders for all and the music pumps through two quality speakers linked to the excellent JBL stereo or iPod jack. The main cockpit features swivelling bucket seats for the driver and observer, plenty of open space for getting the gear ready and a full beam lounge across the transom. There’s a deep ski locker between the driver’s and observer’s seats and a wet locker in the outer side of the transom bulkhead. This is very handy for storing wet life jackets and ropes, so water doesn’t get dripped all over the clip-out cockpit carpet. 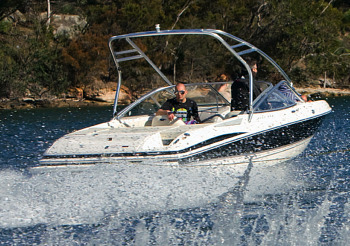 A bow cover, cockpit cover and bimini top are all optional extras and well worth the extra money to protect your pride and joy when she’s not in use, and to keep that harsh Aussie sun off your head during a day on the water. As tested, with the wake tower and 5.7L V8 engine upgrade, this Maxum comes in at $67,490. Base price is $62,000 with a standard 4.3L MPI 220hp. Other engine options are a 5L V8, which I consider are enough horses, because few of us need to travel around at 60mph during normal boating. For this type of boat, 55mph is more than sufficient. The consistent build quality, standard of fixtures and fitting and the ride and handling delivered by the SR3 hull is second to none. But it’s this vessel’s classy looks and versatility that will see her win favour with local buyers. Plus, Avante Marine’s Australia- wide service capability and the Maxum’s five- year hull and deck warranty guarantee years of trouble-free boating. A 5.7L V8, Magnum 350, 300hp sterndrive powered the SR3. At 5800rpm this SR3 hit a top speed of 61mph (53 knots), but throttle back to 2800rpm and she’ll cruise effortlessly at 30mph (26.1 knots).